There's a lot of bike jewelry out there, but this is definitely one of my favorites. 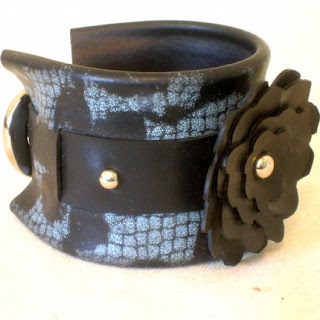 Chaingang Designs created this Innertube Lacelette from bicycle inner tubes, spray paint and a little hardware. The size can be adjusted with the buckle on the back and any color is available, you just have to ask. Couple it with this Skeese Greets bicycle chain birthday card, for a great gift.